Have you seen a real pyramid in life? Think of great pyramids of Egypt once and you will recall the concepts yourself. A pyramid is a three-dimensional shape here with polygon as the based triangle as three sides that are meeting at a single point. Here, the triangular sides are named as faces and the bottom polygon is recalled as base of the pyramid. The number of sides for a pyramid would be equal to the total number of sides or triangular faces of a pyramid. The common point where all triangular faces meet is called the Apex. A pyramid could be any polygon as a base, hence the structure of base is not fixed here. Let us take an example where base is triangular. Since we know that a triangle has three sides then the triangular pyramid would have three triangular bases in that case. They are common in other areas too like architecture, art, designing or more. Now there are two more possible cases for the triangular pyramid. These are regular pyramid and non-regular pyramid. A regular pyramid has a base whose all three sides are equal in length and for a non-regular pyramid; the base has sides of different lengths. 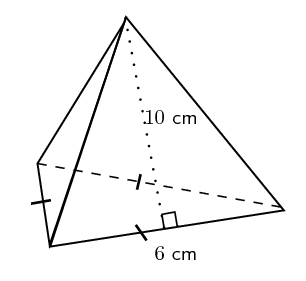 Further, you could calculate the volume or surface area for a triangular pyramid too. You have to use the triangular pyramid formula as given in mathematics. Volume for a pyramid could be defined as the total space occupied by the pyramid. And the surface area could be given as total area of all its faces and base combined. Question 1: Find the volume of a triangular pyramid when base area is 9 cm2 and height is 4 cm ?